Over the past Christmas break, myself and a team of three other guys went on a three week evangelistic trip to South India. We held meetings in a church that labors in the heart of India. During this meeting, we saw individuals put their trust on Jesus Christ for salvation. Christians made life-changing decisions to further serve Christ. The team participated in a village ministry that, prior to the local church’s work, there had been no gospel witness. There were opportunities to teach and preach in the Christian school as well as in the college. Time was made available to be an encouragement to the family and the believers at the local church. All this could not and would not have been done if God’s people had not prayed for us and financially supported us. For this, I am extremely grateful. Thank you for all those that invested in this evangelistic effort. India is in desperate need for the gospel. There is still a great need in India. Many mosques are being erected as the people are deceived by this false religion. On the left is a Hindu temple and on the right is a mosque. It is a very common thing to have a Hindu temple on just about every corner in India. As a light pierces through the darkness, in like fashion the gospel of Jesus Christ penetrates into the hearts of those in India. This is the location of the youth rally that we held in the city. We had games, food, and three sessions of preaching. The Lord blessed and we were able to see some of the youth make decisions for Christ. The youth that attended the rally. There are faithful pastors who love God and are passionately preaching to the lost in India. 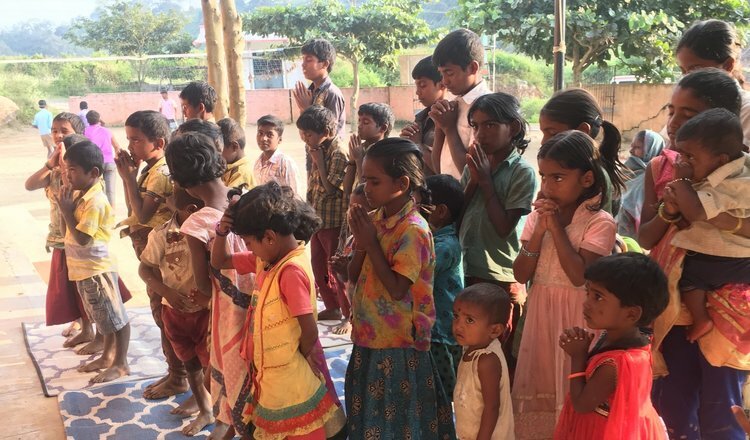 The team had the opportunity to share the gospel from John 3:16 to this group of children in South India. The children in this village come out to hear Bible stories and many have trusted Christ. Christ is building His church in India.